The Italian cooking theme has slightly fallen off the radar of late with my intense focus on job hunting, but a girl’s gotta eat! And so it was that I finally found an excuse to try out Reuben Hills a couple of weeks ago for lunch with a fellow redundancy victim. One may as well do a bit of ‘ladies who lunch’-ing while one can! A long, narrow industrial space, Reuben Hills plays its music quite loud and has an air of hipness which I find slightly intimidating on arrival. However, the friendly girl who greets me and guides me to a table quickly dispels any fears. The lovely Renée arrives soon after and we fall into catch-up mode over a coffee before checking out the food. They roast their own coffee on site – we could see a dark, bearded man checking the machines upstairs – which they sell wholesale and they also hold public cuppings every Friday at 10am. I wish I could tell you what the coffee was like but I can’t remember. I certainly didn’t have any complaints. When we finally stop talking long enough to look at the menu, we discover that it features lots of Mexican and Spanish ingredients: jamon, ranchero sauce, Manchega (a cheese made from the milk of sheep that roam the plains of La Mancha), queso fresco (a Mexican fresh cheese), chimol (a radish salsa from El Salvador), jalapeños, chipotle (smoke-dried jalapeños) and pico de gallo (a Mexican fresh salsa made from tomato, onion and chilis). There’s a mixture of breakfast and lunch items which, pleasingly, are all available all day. I do hate going to a café feeling like eggs at lunch time only to find I’m too late. But today I don’t feel like eggs and I go for the cafe’s ‘signature dish’, the NOT Reuben, so-called because it’s a bit of a variation on the famous sandwich. According to Wikipedia the Reuben is a hot sandwich of corned beef, Swiss cheese and sauerkraut with Russian or Thousand Island dressing, on rye bread. 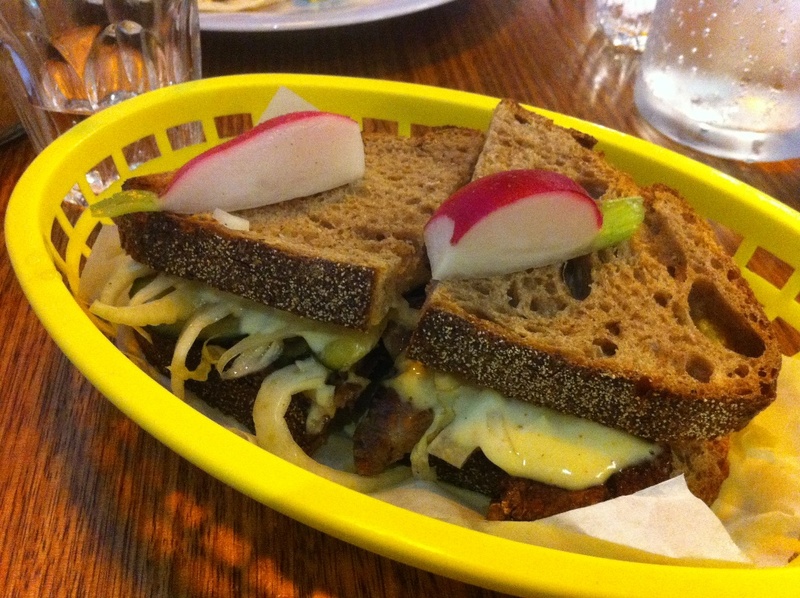 The Reuben Hills’ NOT Reuben comes in a plastic lattice basket, topped with radishes, and has wagyu salt brisket, pickled slaw, Manchega and horseradish cream on rye. Jolly tasty it is too, especially the thick slab of salty beef. However, at $16 a pop I feel it’s a bit on the small side. 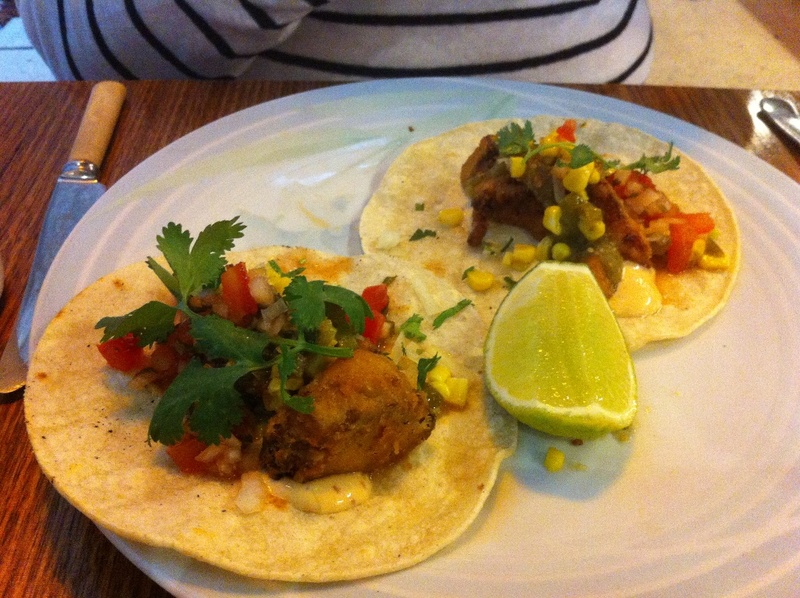 Renee’s corn tortillas with fried chicken, salsa verde and pico de gallo are again very small for the price (also $16). 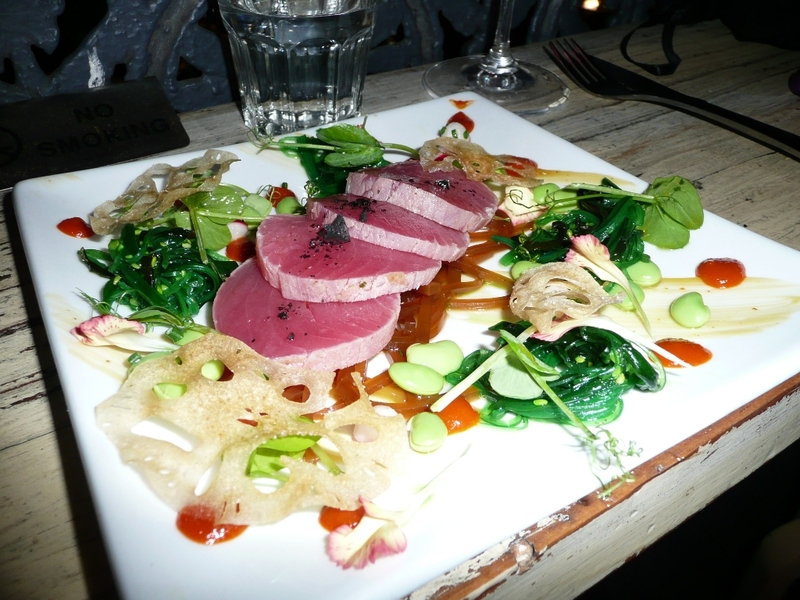 She finds that the flavours are well balanced with no stand-out flavour, ingredient or texture. The fried chicken is not greasy, thankfully. An amiable woman, who I presume is one of the managers or owners, offers us (and persuaded us to have) dessert. I’m up for sharing but Renee’s attitude is ‘no way, Jose!’ to that, so we order two of their Doggs Breakfast – an ice cream sandwich with salted caramel. Who could resist? If I’m entirely honest it’s the principal reason I wanted to come here! 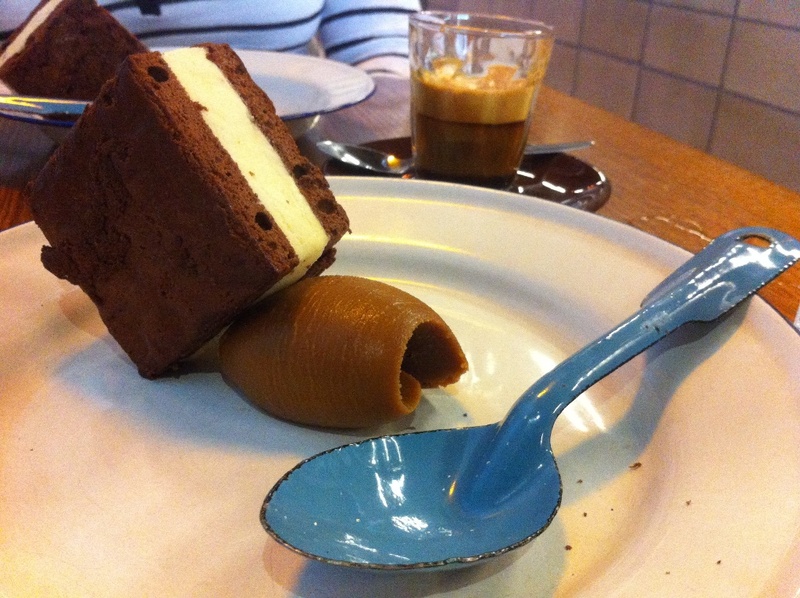 The quenelle of solid caramel is divine – rich, full-bodied and slightly grainy. The Maxibon-style processed chocolate biscuits that encase the ice cream, though, are soft and pappy and let the dish down; it could have done with some crunch to add textural variety. But I do love the blue enamel spoon! It was a greatly appreciated distraction from job hunting (oh, the joys of redundancy!) when I met up with a dear friend last Thursday evening at The Owl House in Darlinghurst. We had both expressed a desire to go there some while ago, but I was concerned that the menu lacked options for a vegetarian; I was proved quite wrong! Monica is sitting at the bar in the small, candle-lit ground-floor room when I arrive and she is already excited about the venue, saying that it reminds her of bars in her homeland of Spain. I join her in a glass of rosé, a 2010 Coates Pinot Noir Barrel Fermented Robe from South Australia, and we climb the narrow, creaky staircase to the dining room upstairs. At the front of the building there’s an extremely narrow balcony with a shelf to eat off and we perch ourselves on stools there, feeling quite like the eponymous bird-life, peering down from our coop at the quiet end of Crown Street. We order three very different dishes, all vegetarian, and are genuinely delighted by the originality and fabulous flavours of all of them. 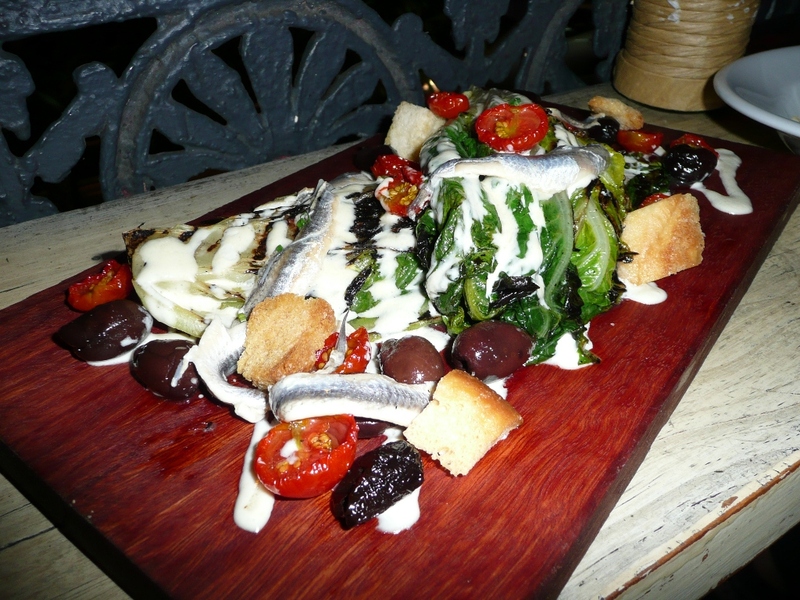 A whole grilled baby cos lettuce comes on a wooden board draped with Spanish white anchovies, semi-dried cherry tomatoes, kalamata olives, chunky sourdough croutons and parmesan dressing. A robustly flavoured adaptation of a Caesar salad, the char-grilled lettuce is surprisingly moreish and the anchovies fat, shiny and sweetly briny, all drenched in creamy, cheesy dressing. Cured bonito on pickled papaya and mint salad, with yuzo gel, chilli jam, wakame and radish is altogether a different story with refined, clean Asian flavours. The fish is of superior quality, like sashimi, beautifully complemented by the umami flavour of the seaweed salad and the papaya which is pleasantly reminiscent of mango chutney. It’s pretty as a picture, too, with its vivid pinks and greens. 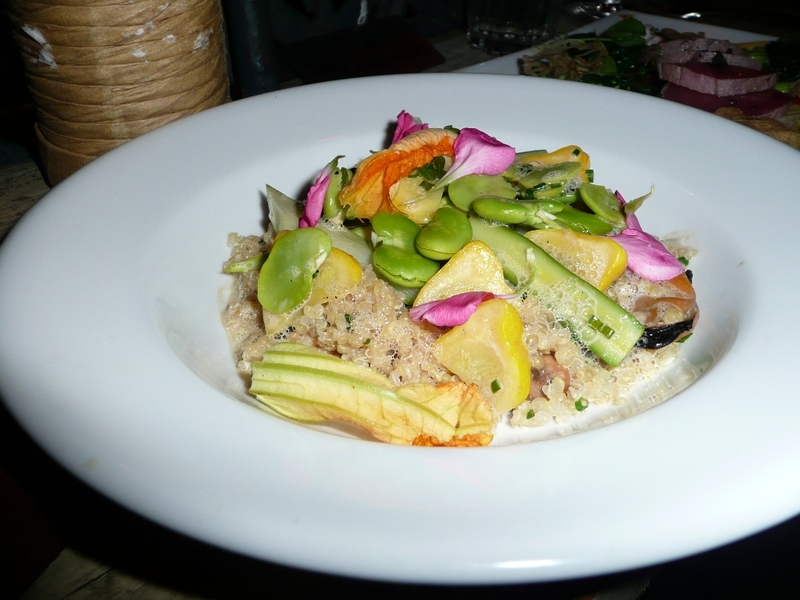 Also very attractive to look at is a warm salad of quinoa, broad beans, Boston Bay mussels and zucchini flowers, served with foamed mussel sauce. The most unusual of our three dishes, the crisp Spring vegetables and softly granular quinoa hide a wealth of large, plump, sweet mussels at the bottom, and the light sauce has a lovely lemon acidity with perhaps a touch of white wine. To finish we share a butterscotch panna cotta with caramelized nuts and coffee liquor, served with almond chocolate candy. Monica declares it a proper Spanish ‘flan’, which is better known in Australia and the UK as a crème caramel. 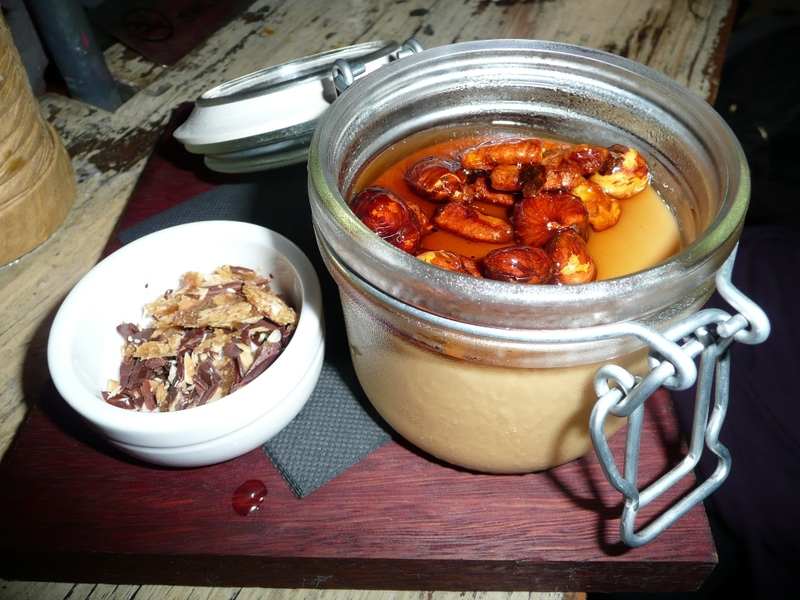 The contrast between the cold, very smooth, panna cotta and the crunchy, sticky nuts is inspired, and the butterscotch and caramel flavours are right up my alley. This is a great little bar with an international wine list, adventurous and delicious food, and warm, friendly service. I expect we’ll be back! Luciana Sampogna appears to the waiting, aproned class members, petite, dark and slightly harried looking. With the briefest of introductions she begins sweeping a pile of flour into a wide well on the wooden work-top and cracking in eggs. Beating the eggs with a fork she gradually incorporates some flour until the mixture is no longer runny, then begins scraping and squashing in the remaining flour with a broad, bladed tool until it forms a dough. She explains the crucial contribution of the moisture in the air and that we will all have to put up with the un-air-conditioned heat until after we have made our pasta dough. “Now you must go in and see if he complain,” she says in her wonderful accent. Translation: test if the dough has too much moisture. She then demonstrates a kneading action used to feel if the dough is sticky. Her eyes are barely open as she communes with the pillowy mass and adds more flour, a sprinkling at a time, until it reaches “just past the complaining point”. Now it’s time to knead the dough for a full six minutes to activate the gluten and make it stretchy. She uses her whole body as she rocks her weight from back foot to front foot, leaning into the dough with the heel of her hand before pulling it back towards her. It’s a labour of love. “Dancing with the dough,” she calls it. Just watching her in this simple repetitive act, you see, you understand her yearning, desperation even, to hand down the secrets of her food culture and in doing so ensure its survival. Cucina Italiana, Luciana’s cooking school, runs from her own home, a beautiful heritage-listed Italian villa in Annandale, built by the Melocco Brothers for their mother almost a century ago. Growing up near Venice, Luciana learned a love of Italian food from an early age, watching her mother and grandmother cook. She studied under the famous Simili sisters, Margherita and Valeria Simili, in Bologna. Since 1998, when Luciana opened her first cooking school in Auckland, she has upheld the sisters’ philosophy of passing on the traditions of regional Italian cooking to thousands of eager students. All 24 of us make our own pasta dough from the neat hillocks of flour already measured out onto the benches in the split-level kitchen. The eggs are piled into rustic wire baskets in the centre of the tables and we each have a fork and a scraper. Once we’re done our kneaded mounds are placed under a large upturned mixing bowl to rest and keep moist. Meanwhile we move through to the dining room to watch Luciana make antipasto. We’re seated at a long, white-clothed table laid for dinner underneath an ornate moulded plaster ceiling with a chandelier. Luciana takes centre stage and mashes borlotti beans with a potato masher, to keep them chunky. She adds finely chopped red onion, a few drops of red wine vinegar, chopped parsley, salt and pepper, a shocking amount of extra virgin olive oil (there are a lot of us, after all) and some olives. She tastes and checks the seasoning, her eyes flickering as she goes inside herself once more, then spoons the beautiful, unctuous concoction into two large bowls for us to eat with warm, dense Italian bread. It’s so simple and yet so delicious – the texture of the beans, the mild kick from the onion, freshness from the parsley, all bound by luxurious olive oil. Accompanied by a glass of wine, poured by Luciana’s two kitchen hands, it’s a majestic start to the meal. As we eat, Luciana explains that bread is a big part of traditional Italian cooking, padding out a meal and providing comfort to the stomach in times of great poverty. In Tuscany, where this antipasto recipe comes from, they eat a lot of beans and vegetables and not much meat. Once we’ve finished, Luciana whips up a quick coffee-flavoured semifreddo – egg yolks, sugar, espresso, cream and egg whites – and bungs it into the freezer in a clingwrap-lined loaf tin. Next we’re back in the kitchen rolling out our pasta using a pasta machine. Once at the correct thickness we form it into ‘tortelli’ with two pre-prepared fillings of roasted pumpkin and beetroot, both mixed with parmesan, salt and pepper, freshly grated nutmeg, and egg to bind. Our little parcels are left on racks to dry in front of an electric fan while Luciana demonstrates ‘scaloppine with herbs’. She beats and stretches thinly sliced chicken breasts (you can use veal, too) with a smooth mallet, “to make the husband think he has a big piece of meat on his plate!” Dusting them in seasoned flour, she briefly pan fries them in butter and olive oil. Many in the class gasp every time she adds salt, butter, oil or cream to anything. She acknowledges the current fear of salt but says, “You eat salt, you get heart disease. You don’t eat salt, you get mental disease. Which you want to die of?” which produces a laugh. The sauce for the scaloppine starts with chopped garlic and chili in olive oil, gradually heated from cold and stirred constantly so that the garlic imparts all its flavour to the oil and colours only slightly before being deglazed with white wine. To that she adds fresh herbs, lemon juice and zest, and chicken stock and lets it reduce a little. Meanwhile, the kitchen hands have been cooking the pumpkin tortelli and they bring them over, still in their enormous pot of boiling water. Luciana makes a sauce from melted butter, thickened cream and nutmeg and scoops the tortelli from the pan straight into the sauce, swirling to coat them. Colanders are a no no for fresh pasta, given it’s so fragile, and she uses a wonderful large wooden implement called a ‘mandolino’ that reminds me of a lacrosse stick. We’re told she can only find them in Italy and brings them back to Sydney by the suitcase load! We’re herded back into the dining room and soon they’re serving the tortelli to us in shallow bowls, three of each kind. The beetroot ones are coated simply in melted butter with sage leaves and a sprinkling of poppy seeds. Perfectly al dente, they’re worthy of any restaurant and I can’t believe they’re made by our own fair hands! The scaloppine come next on large plates in a pool of the herby, wine sauce with more fabulous bread (from Haberfield, next to the IGA) to soak up the juices. Luciana turns the semifreddo out of its tin, peels off the clingwrap and dusts it generously in chocolate powder before it’s taken away to be sliced and plated. It’s a lovely cool, sweet, creamy end to the meal. Luciana takes questions during which she tells us we can use any leftovers in tortelli, including roasted meats – that’s the Italian way. “I aim to record and safeguard the Italian cooking heritage which has been lost in many misinterpreted recipes around the world… I aim to preserve the soul of Italian cooking – so rustic, so simple but so defined,” says Luciana in the introduction to her book Light of Lucia: A celebration of Italian life, love & food. A little bit in love with her, I can’t resist buying it at the end of the class and in a large, florid hand she writes inside: ‘Caroline – Enjoy the flavours of Italian life – Luciana – 6.11.12.’ I feel this as an entreatment rather than a friendly wish; an urging to take what I’ve learned, practise, improve, continue to learn, at all costs keep the knowledge alive. As we gather our belongings she implores us all to make pasta again at the weekend, “otherwise you forget”. 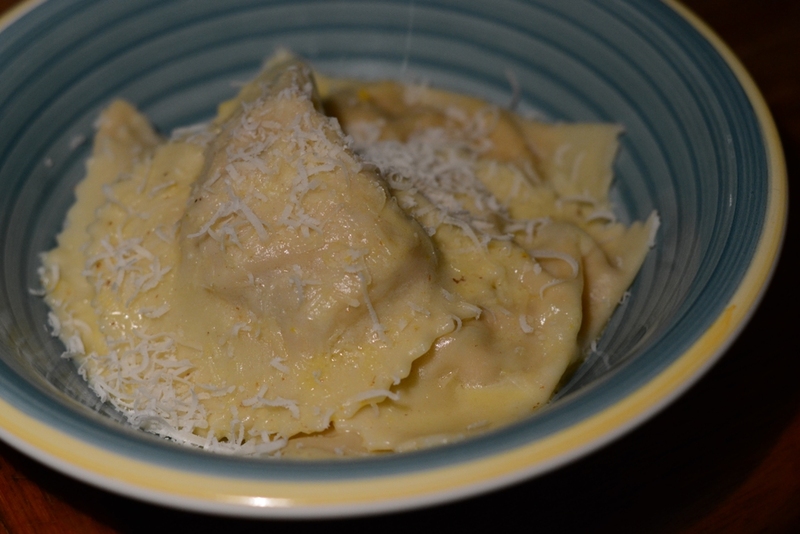 Well, I’ve done as I was told (Luciana is slightly scary, after all) and I made tortelli for dinner last night. 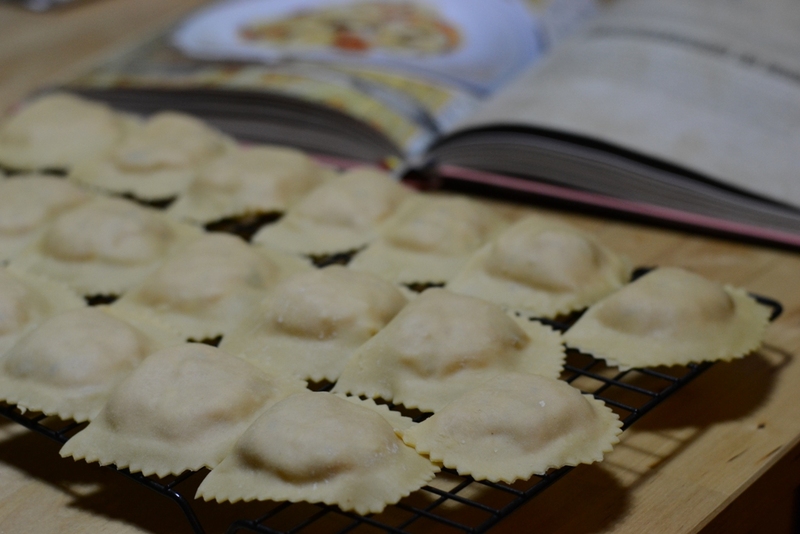 The pasta dough did not form as easily for me on my own as it had in class, but it came good in the end and tasted just the same, which makes me think it must be quite a hardy substance, unlike, say, pastry dough. As luck would have it Mr T had roasted some pumpkin and parsnips earlier in the week and there were loads left over, so I felt I was being authentically Italian in using them up in the filling. Luciana would most definitely approve. We may not have eaten until 10pm and the kitchen may have looked like a bomb site, but the result was enormously satisfying – as were the oohs and aahs from Mr T! Exhausted and happy I felt something of Luciana’s labour of love, her mission to preserve her culture, and in some very small way, felt I’d done something to contribute to that great goal. There are many features of The Grounds’ interior design that come straight from my fantasy kitchen checklist: farm-house style timber cabinetry with granite tops, plenty of industrial shelving and glass-fronted cupboards, and floor-to-ceiling white tiling reminiscent of old-fashioned butchers’ shops. 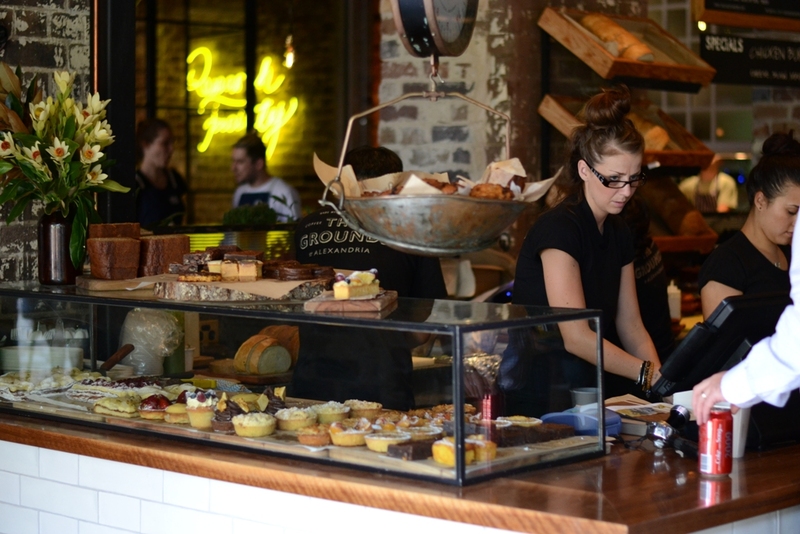 Now imagine all of this in a large, high-ceilinged former pie factory with polished concrete floors and exposed brick walls and you’re half-way to conceiving the splendour of The Grounds. 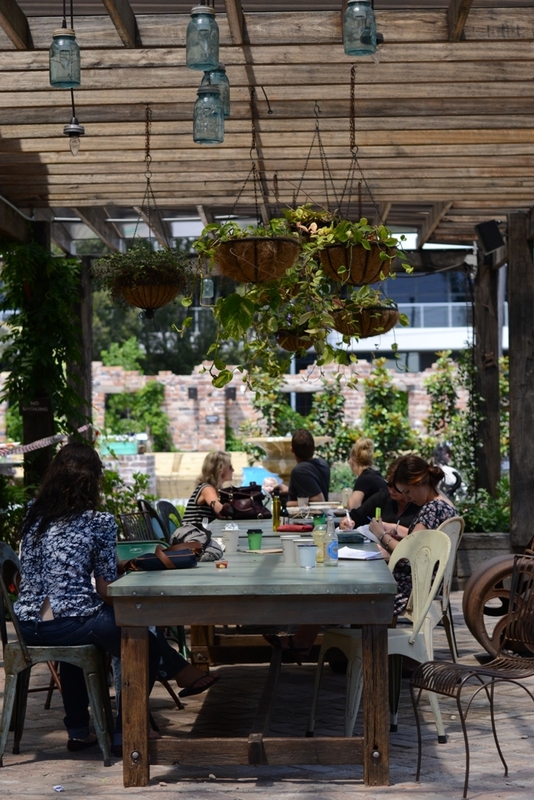 Add to that an enormous semi-covered garden with long trestle tables under groaning hanging baskets and simple glass lanterns, and veggies and herbs grown in raised beds built from old rail track sleepers. Then there’s the coffee research facility where they test different roasting profiles and techniques on the single estate and single origin beans which they source from various regions of the world. And we haven’t even started on the food yet! The breakfast menu is available only until 11.30am so a return visit will be in order. I thoroughly approve of its emphasis on free range eggs with various mouth-watering accompaniments: lemon myrtle mushrooms and brioche; tomato sauce, cannellini beans, spinach and labneh; double smoked ham, avocado, Persian feta and pesto; house cured ocean trout, dill crème fraiche, pickled cucumber and herbs. Lunch features salads, sandwiches, a burger, a cheese board, a pasta… nothing radical but all of it utterly delicious sounding and featuring plenty of veggies and herbs from the garden. 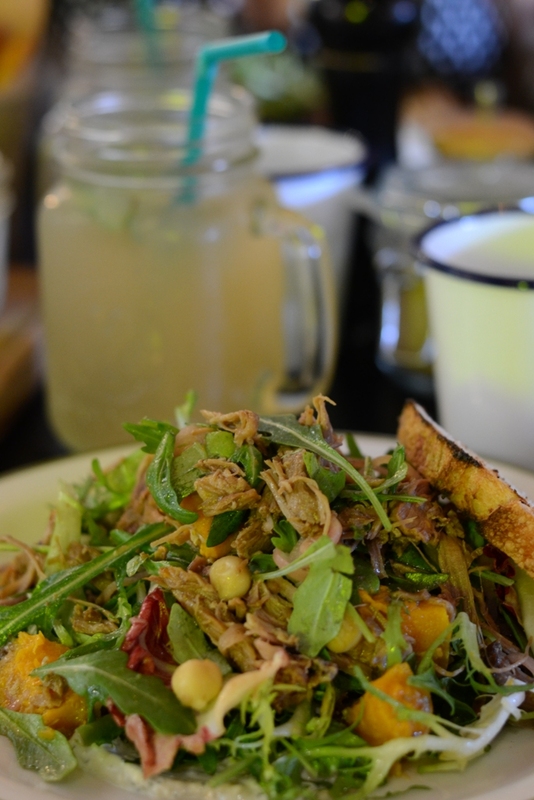 A slow cooked lamb salad with roasted pumpkin and chickpeas is fresh and plentiful with tender, rich pulled lamb complemented by a sweet, sharp sherry vinaigrette. 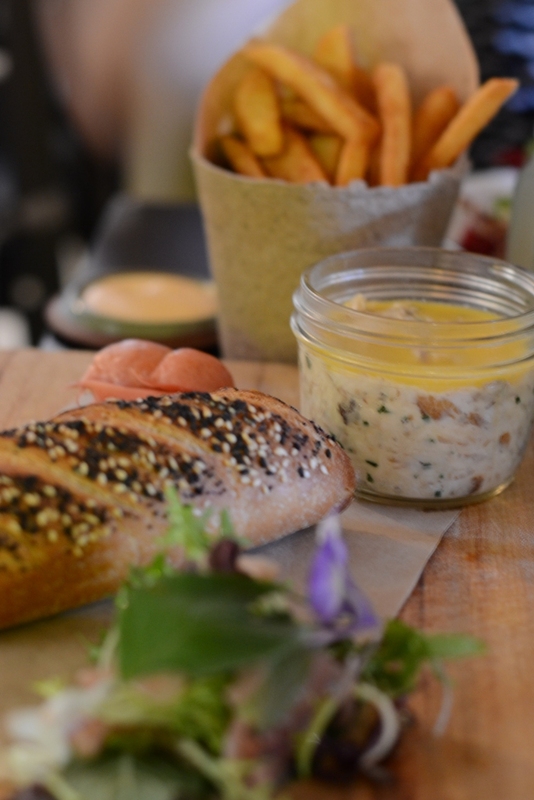 Tea smoked kingfish rillette is beautifully smokey, as you might expect, and comes served in a glass preserving jar sealed by a veneer of butter, with a crusty seeded baguette, pickled radish and salad garnish topped with pretty edible flowers. We share a brown paper cup stuffed with fat, dark golden, salty chips, their outsides fluffed up slightly to make them incredibly crunchy. To drink there’s ginger beer served in glass jars with handles and fresh mint from the garden. Having admired the cakes and tarts on the way in we simply have to add a couple to our bill as we pay on our way out. For afternoon tea, back at the office, we share a dark chocolate dipped florentine and a divine peach tart, its frangipani filling light and moist and the fruit juicy and intensely peachy. 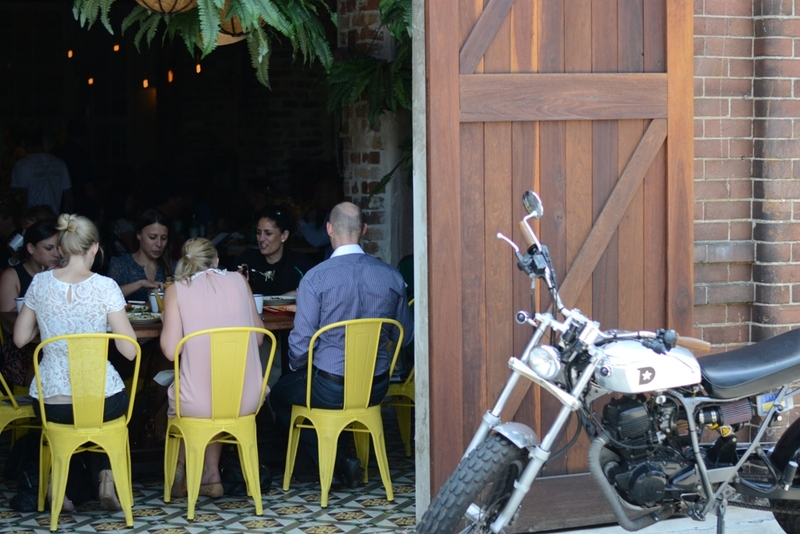 The Grounds is ridiculously popular at the moment – deservedly so – which means that even on a week-day you’re likely to wait for a table. We waited, on a Thursday, only ten minutes, which we passed very pleasantly perusing the menu in the garden, but Clare has queued for an hour at the weekend. Another option is to line up for takeaway and eat it in the garden. (I’m not sure why they’re not doing table service to the garden; perhaps that will change.) The takeaway menu is much more concise, however, so my advice would be to go the eat-in option and don’t be in a hurry – you’ll be richly rewarded.